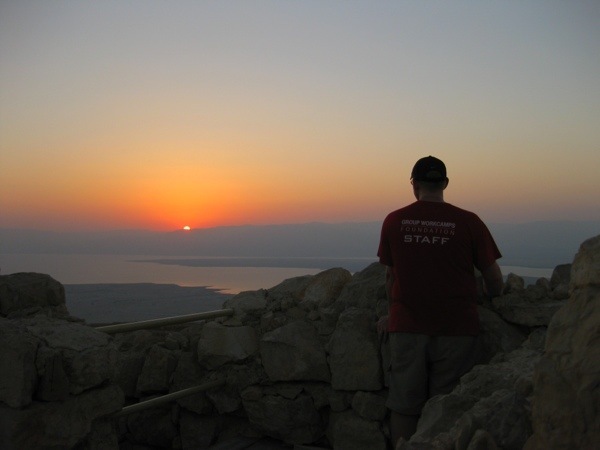 Here’s a taste of my photos: this morning I climbed Masada before sunrise to watch this scene, 5:48 a.m. Israel time. It’s been a while since I wrote; I haven’t found much time to blog over the nine days or so that I’ve been in Jerusalem. But, I have found the time to post my photos to Flickr pretty regularly. So, this brief blog post is an advertisement to go see my photos on Flickr. I try to use the captions of the photos to tell a story of sorts, so that may substitute for the blog while I’m busy going from place to place. Jerusalem Photos: A compilation of all my photos relating to Jerusalem. This takes from a couple of albums, including Welcome to Jerusalem, All Museumed Out, and The Last Week. “All Museumed Out” sort of reflects my attitude after visiting museum after museum in Jerusalem over the past week, while “The Last Week” includes my visit to the walls of the Temple Mount, Garden Tomb and the Church of the Holy Sepulcher, via the Via Dolorosa. Day Trippin’: Beginning on Saturday (July 21), I began some day trips to round out my time in Israel, first to the West Bank and then to Masada and the Dead Sea. As of posting time, the upload of these photos is still in progress, so you may want to check back later for more of them! Tomorrow morning I am heading back to Galilee and Hazor to hang out around the Sea and also to see the progress at the dig. The bus ride there and back is about two-and-a-half hours, so if I don’t sleep that time away, perhaps I can get some new blog posts up. Let’s hope! Hi Rob! Glad to read a new post from you. It sounds like you have been very busy sight seeing. All the pictures do tell a story & they are great pics. I bet you are anxious to go back & see how much progress has been made at the dig. Safe travels! Rob, you have taken such great pictures. This mornings picture is beautiful with the sun rising, great time for reflecting.